But the simple fact is most business owners dont know how to use it effectively. 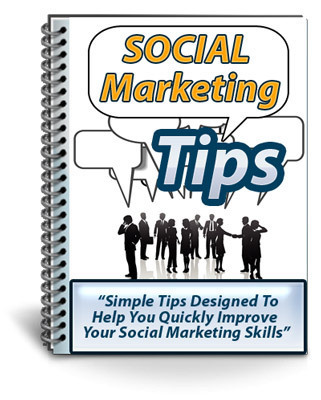 The Social Marketing Tips series was specifically designed with beginners in mind. So even if youve never heard of social marketing before or used it to promote your business, you will discover how to focus your marketing efforts and quickly harness the power of social marketing for your own business, products and services. The best part is with the private label rights to this series not only will you be able to learn the ins and outs of social marketing for your own business, you will be able to pass that knowledge on to your subscribers. You will be providing them with quality information that will help them understand the basics of social marketing and how they can use it to their advantage. And since it comes with private label rights you will be able to quickly set it up and use it to educate your members, subscribers and as a lead generating tool to get more traffic to your own website. The entire series is completely customizable. With a few clicks of your mouse you will be able to add in your own contact information email in the series. You will also have the freedom to include your own product and service recommendations along with links to your favorite affiliate programs. Im even including a ready to go to squeeze page confirmation page and sales page, so that you can get set up quickly and easily!